While steeping an Irish Breakfast blend from The Boston Tea Company, it occurred to me that I enjoy reviewing teas, but I don't often read reviews from others. I will try a tea based on the type and quality, or merely out of curiosity. I try to keep an open mind to try as much as possible. I post tea reviews as an outlet for expression. 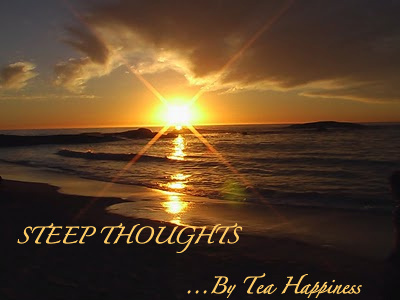 I enjoy writing and thinking about tea as a personal experience. I like reading reviews that give me a bit of insight into the author, but I don't use the review as fact. Tastes are so different, and a flavor that one person picks up may be missed by another. Overall, tea reviews have helped me steer clear of products of poor quality and also remind me to try new teas that sound interesting. But I won't jugde a product just on a taster's notes alone. Preparation can vary as well, which may change the taste. I like to slightly oversteep my black teas because I prefer a stronger brew. Positive reviews certainly help spark my interest in a tea, but it's not the deciding factor. Tea friends, what do you do? Do you read endless tea reviews for guidance, or do you have a different method for selecting teas? I think I've seen other bloggers discuss this issue in the past. I find others' reviews interesting, but I always recognize that people have different tastes. A while back I designed a user comparison system for RateTea.net, and I found that the highest "match" on the site was 67%...meaning that, picking two random teas that we have each sampled, we would prefer the same tea only about two-thirds of the time. And that's the closest match in terms of tastes in tea. I find it very interesting to read reviews though. The better writers and more experienced reviewers are often able to articulate the difference between a tea that they think is not very good quality, and a tea that they think is high quality but just do not personally like. I find some bloggers are also good at writing their descriptions and reviews in such a way that makes it easier for me to know whether or not I'll like a particular tea. This practice takes great skill, but, in my opinion, is one of the hallmarks of a top-notch reviewer.